For such a dull sounding project, this one was fraught with all sorts of angst and self doubt. Being at home with the kids is a messy job, and I hate to invest in clothing that will inevitably suffer multiple stains and abuse. On the other hand, I don’t want to wear stretched out yoga pants and a t-shirt all the time (I save those for painting clothes!). I love wardrobe makeover shows, but too often they show outfits that are just not practical for working at home (the original British What Not to Wear was the exception–they chose clothing appropriate for how people actually spent their day, rather than artificially dressing them up). On a style scale between “Frumpy” and “Trendy,” I aspire to fall somewhere in the middle on “Classic.” I’m not ashamed to admit that Lands’ End is my favorite clothing retailer, and the phrase “statement jewelry” makes me shudder. Just before school let out, I swept through the kids’ closets, pulling out all the outgrown clothing and winter wear. It probably took me an hour, total, to complete all three kids’ wardrobes. I flew through the decisions: if it was too small, too stained, or an item the child didn’t like and wouldn’t wear–out it went. Easy. 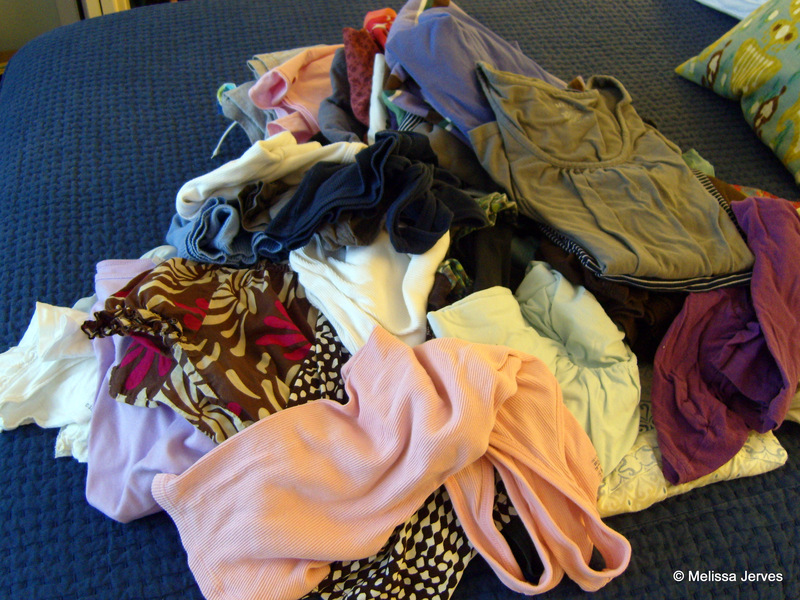 But when faced with my own overflowing dresser drawers, winter and summer wear jumbled together, I could only look on the pile of clothes with dismay. If I pulled out everything that was too small, too stained, or that I didn’t like, what would be left? But I sorted them anyway. 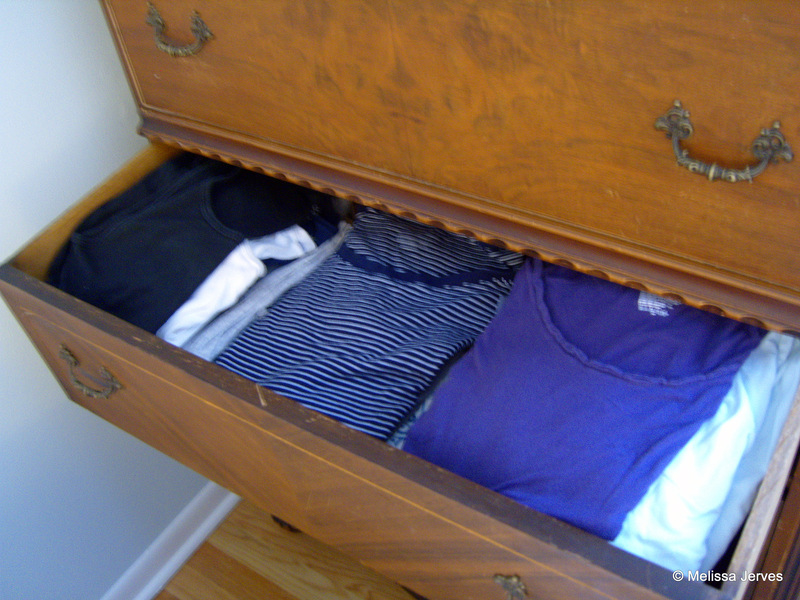 All the winter clothes went to the top shelf of the closet or the storage box under the bed. I sorted what was left, and did pull out half a dozen items to donate or put in the rag bag. Then I made a stack of “stuff to wear around the house” and “stuff to wear in public,” and put it neatly back into the drawers. In any case, I’m nowhere near solving my style dilemmas, but at least my dresser drawers are tidy. I’ll keep reading style blogs like Ain’t No Mom Jeans (sometimes too trendy for me, but at least they’re practical!) and try not to succumb to $4 t-shirts at Target that look pilly after two washes. Thanks for the recommendation, Alana! I can’t wait to check it out! Oh, I hear you on the Target T’s! Just say no! 🙂 Have you heard of Project 333? It really helped me get a whole new perspective on clothes. I’m buying less than I ever did, and I like what I have more. I’ve heard of it, but I’m going to explore it some more. The reality is that I probably reach for the same 15-20 items most of the time, anyway. Thanks for the recommendation! A few weeks ago I bought two different style solid cotton dresses from Target (about $20 each), and I bought them in every single color. I’ve also bought some patterned cardigans that coordinate with the dresses. Voila, instant inexpensive but attractive uniform. I did the same thing this week with all of our clothes. My husband went out and refreshed his wardrobe last week (costco tshirts are his favourite – he’s not an expensive shopper). Last night I saw three articles of clothing that I loved in this little shop, together they were over $400. Not going to happen. At some point, I’m going to have to see if I can just sew up some new shirts, as the majority of mine have little holes in them…but how to justify the expense? I experience the same issues. I am the queen of stain and don’t want to wear the same set of clothes around the house I do when I go out, but I don’t want to be frumpy either. I rediscovered the Goodwill this past week. I haven’t shopped there in ages and am hoping to re-stock my wardrobe with inexpensive, comfortable clothing I can wear in or out. I’ve had some good luck at our local Goodwill, but I haven’t stopped there in ages (dragging the kids along is…a drag!). I’ve even found items new with tags! I even bought something once that didn’t fit, so I returned it. I have about $4 in store credit to spend!